Today is National Blonde Brownie Day. Crazy right? Usually, I can't work up enthusiasm about that sort of thing but with the cold weather that has been laying waste to much of the country lately, I'm happy for anything that takes my mind off the weather. Besides, this gives me an excuse to fire up the oven and warm things up a bit around here. Not that I'm not cooking all the time as the owner of the Stack Shack Restaurant. Luckily for me, and my customers, my friend Dani's family has a recipe for the world's best blondies. I've asked Dani's grandmother if she'd let me share it with all of you. Olive is a generous woman and happily agreed. Considering the family sugar making business, not surprisingly it is made with maple syrup. I hope you'll take the chill off at your place by whipping up a batch of these delicious treats for your family. Preheat the oven to 350 F. Spray a 8 x 8 baking dish with non-stick cooking spray. In a saucepan heat the butter and brown sugar over low heat until the butter is melted and the sugar is dissolved. Remove from heat and stir in the maple syrup, egg, and maple extract. In a separate bowl whisk together the flour, nutmeg and salt. Add the dry ingredients to the contents of the saucepan. Whisk together until smooth. Pour into prepared baking dish and bake for 22-25 minutes. These are meant to be soft, even a bit undercooked by most baking standards. If this is not to your liking, increase the baking time by three-minute intervals until a desired degree of firmness is achieved. Thank you for the recipe. Can't wait to try it. I read Drizzled to Death, a couple months ago. Thanks for stopping by and for reading Drizzled with Death! I hope you love the blondies. I'm glad Olive is generous with her recipes. This sounds delightful. I hope you get the chance to try out her recipe! They are wonderful, especially still warm from the oven! This would be a great day to try that recipe! It is! And baking warms up the house too! I just finished reading the book. Hope there are many more in the series. I want to try the maple martini recipe from the book. I am so pleased to hear you enjoyed Drizzled with Death. 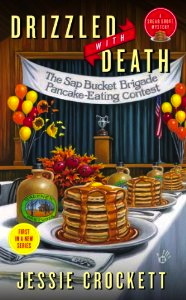 The next in the series, Maple Mayhem will be out July 1. Nothing would go better with it than a maple blondie and a maple magic martini! Im looking forward to reading this series!